White t-shirt featuring photo of Paul McCartney on the front. Live the shirt, fits great and looks amazing. Red rose speedway is my favorite post Beatles Paul project and I was pleased to see this available. Would love to have more such items available. I absolutely love this shirt, it's perfect! 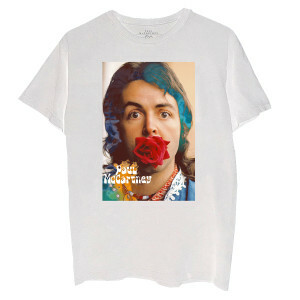 Sharp looking McCartney t-shirt. Look forward to the Red Rose Speedway archive collection!